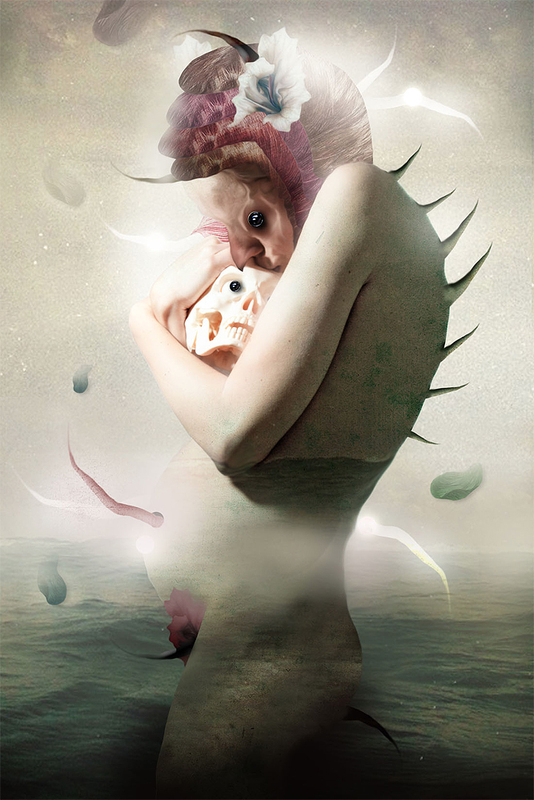 MY personal interpretation of SAMSARA - The cycle of death and rebirth to which life in the material world is bound. Birth, growing, learning, exploring - fading, passing, hurting, forgetting, decomposing... Circle of life is cruel, circle of life is beautiful, its a wheel of fortune, its a mysterious ride, it is instinctive and primal, delicate and fragile ugly and graceful at the same time. I wanted to bind two different parts of one "coin", to show how united are the beginning (birth) and the end (death), how close are one to each other in every single moment. I have tried to capture our journey through life in one single powerful image. Using iconic symbols of life and death - pregnant woman who's holding tight a skull in her arms while kissing it i had intention to unite life and death merged in a kiss, intimate touching kiss that celebrates life and accepts death as the order of the natural circle. I have created very disturbing piece probably that can touch viewer on many levels, but also wanted to leave the veil of smooth shady mystery which allows to the observer to make his own interpretations and conclusions..